With industry-leading features, Jacobsen's new ZT400 and ZT600 zero-turn series delivers dependable performance and professional results. The ZT400 is available with up to a 24 HP Kawasaki® or 25 HP Briggs & Stratton® engine, and 48-, 54- or 60-inch width of cut and ground speeds of up to 9 mph. The ZT600 is available with up to a 24 HP Kawasaki FX or a 25 HP Kohler® Confidant EFI Engine, and 48-, 54- and 60-inch width of cut and a ground speed of up to 10.5 mph. The new Toro Workman GTX utility vehicles combine superior comfort, control and durability. Equipment Managers can select either gas or electric models to match the right vehicle to their specific needs. Among the options are: two- and four-seat configurations, choice of box bed or flatbed and the ability to customize a wide range of work attachments to provide optimal versatility. Earth & Turf Products LLC announced its CarryCat™ tool carrier to fit 3-point hitches of compact tractors. This useful attachment is designed to carry conveniently and securely most commonly used landscaping hand tools. Features include stand-alone storage with adjustable stand-off feet to suit a variety of tractor sizes, adjustable gasoline can holder, soft-lined chainsaw mount, and receiver for drawbar. Fabricated with a heavy-duty powder coated finish. Shift into multi-tasking mode with VersAttach™, a configurable, removable, track-based bed attachment system for Carryall® utility and transport vehicles. Ideal for turf or ground management, it accommodates tools and equipment on holders that fit inside and outside the bed. This frees bed space, protects gear and reduces round trips. Features include: standard, ratcheting and long tool holders, backpack blower racks, ladder racks, short and long bed dividers, and cargo tie-downs. The Z960M ZTrak™ mower provides professional landscape contractors with a powerful, reliable machine at an affordable price point. Boasting 31 HP, the Z960M is available in three deck offerings: 60 inch, 60 inch Mulch On Demand™ or 72 inch. Available with a variety of options, including dump-from-seat Material Collection System capability, three-way adjustable suspension seats and easy-to-use diagnostics, the Z960M is designed to provide an efficient solution to meet the needs of landscape contractors. ECHO's new ProXtreme Series ™ is redefining the performance standard for grounds maintenance. 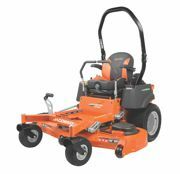 The full lineup includes a Trimmer (SRM-2620), a high-torque Trimmer (SRM-2620T), a Brushcutter (SRM-2620U) and an Edger (PE-2620). Each one features a revolutionary combination of low weight and high horsepower, along with exceptional air filtration and long runtime. The trimmers and brushcutters are equipped with easy-loading Speed-Feed® 400 cutting heads, which reload in seconds without disassembly. The edger features a clog-resistant shield. Hand built in America, the Brush Blazer is the machine for total brush devastation. With its go-anywhere tracks and 48-inch cutting width, look no further than PECO's Brush Blazer to demolish anything in its path. You will be able to maneuver about the most irregular terrain or climb nearly any include while cutting and mulching trees up to 4 inches thick. Not to mention, turn on a dime with its zero-turn radius type steering. For maintaining synthetic and natural surfaces, the fds Sport gets the job done smarter and faster. Quickly revives old and compacted synthetic turf to get the spring back into the rubber-crumb top dressing in one easy pass. Efficient and effective dethatching after winter kill and repair flood impact zones. Prepare baseball fields in a matter of minutes. Easily pulled with a quad with a magnetic sweep attachment, and superior adjustments for relieving compaction and preparing turf to perfection.